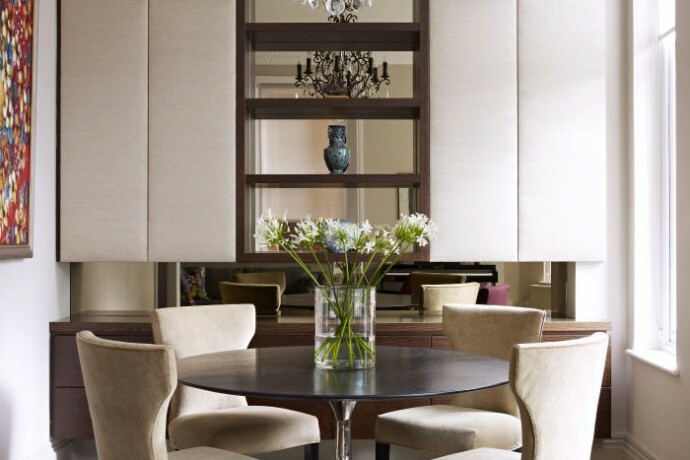 Callender Howorth offers an array of interior design services within the London’s commuter areas. Our talented team of interior designers in Sevenoaks is driven by a passion for traditional British design, delivering a complete interiors service for our clients. We have a bespoke solution for your design needs, whether your property is being built, extended, renovated or restored. All aspects of design, from lighting to storage, are considered to create your ideal living space. Feel free to browse our completed projects to fuel your imagination. Sevenoaks is a quiet but prosperous commuter town around 25 miles southeast of London. Beautiful Victorian and Edwardian semi-detached houses line the streets near to the centre of the town. The outskirts have more modern buildings from the twenties onwards as well as some Victorian terrace cottages. There are a number of detached houses in the most sought-after positions close to the town centre, station and local schools. Sackville Place is a central Sevenoaks development of 10 exclusive flats and one large detached house overlooking The Vine Cricket Club. Savvy investors can buy a property for just over £800,000, but once renovated and refurbished by a Sevenoaks interior designer they can increase in value to around £1 million. Whichever type of residence you own, our interior designers in Sevenoaks can transform your home into one which best reflects your tastes. What can residents find to do in Sevenoaks? The High Street has a good selection of shops, boutiques, eateries and bars. There is a fantastic selection of cafes and restaurants, such as Mimi Bakery and the stylish restaurant The Vine. Sevenoaks is great for fitness enthusiasts and those who enjoy the great outdoors with the National Trust-owned Knole, which belonged to the Sackville family for 450 years. The 1,000-acre deer park is a beautiful place to stroll. There are also several leisure facilities in the area including, St Julians Country club and Sevenoaks Tennis and Hockey clubs. Golfers can enjoy a game at Wildernesse and Knole, and cricketers are well-catered for at The Vine and Sevenoaks Rugby Club. In fact, the Vine is famous as a Kent Premier League club with recent achievements as Champions of Kent in 2014. Why would you want to live in Sevenoaks, TN? Which famous residents live there? Although it’s only 21 miles south of London’s Charing Cross station, Sevenoaks is a world away in terms of character. It appeals to commuters who want to be close to the capital, particularly the City of London. Celebrities who live in or have ties to Sevenoaks include Princess Diana, Winston Churchill, Strictly Come Dancing’s Anton Du Beke, England hockey player Cathy Gilliat-Smith, broadcast journalist Peter Sissons and TV presenter Gloria Hunniford. Sevenoaks is a wonderful place to raise a family with a selection of good schools in the local vicinity including Sevenoaks School, which is an internationally renowned co-educational day and boarding school for 11 to 18-year-olds. Other options spread around the locality include New Beacon, Solefields, Trinity Free School, Knole Academy and the recently opened Weald of Kent Grammar. Sevenoaks train station offers excellent transport links to London and the M25 is a couple of miles away providing drivers with convenient links to the UK’s motorway system. London’s airports are easily accessed with Gatwick Airport just over an hour away and Luton is around 15 minutes’ drive. Commuters can reach London Bridge in less than 30 minutes and Charing Cross and Cannon Street in just over half an hour. Please contact the dedicated team at Callender Howorth to discuss your Sevenoaks interior design needs.